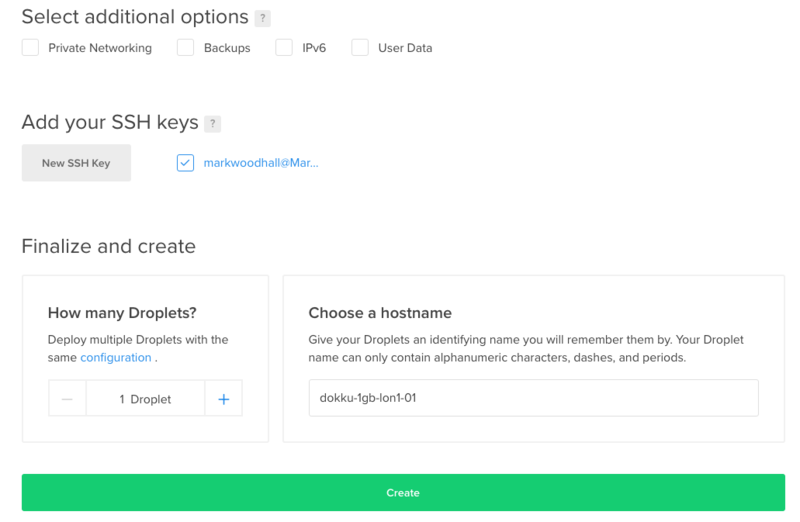 Mark Woodhall: Deploying Cryogen to Dokku and Digital Ocean. Deploying Cryogen to Dokku and Digital Ocean. I've recently moved my blog away from Ghost Blog hosted at Digital Ocean. While I enjoyed using Ghost I always found upgrading a bit of a pain and wanted a little bit more control than it gave me. 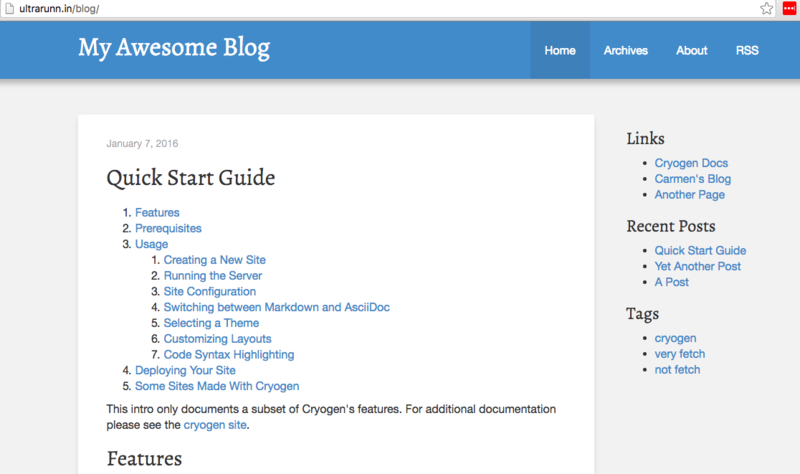 I've used static site generators previously and this time opted to go with Cryogen. I chose it because it's written in Clojure using technology I like and am familiar with, it looks relatively complete and gave a number of options for deployment. 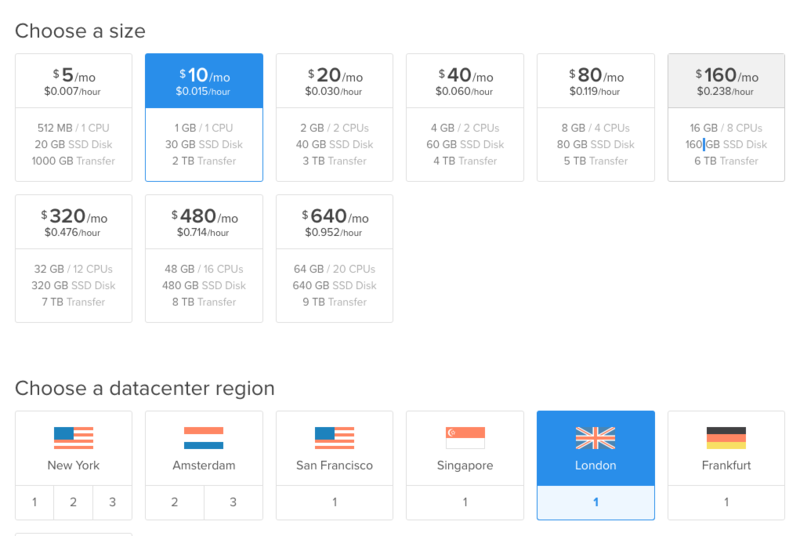 This post is a guide to deploying a Cryogen site using Dokku to the cloud infrastructure at Digital Ocean. 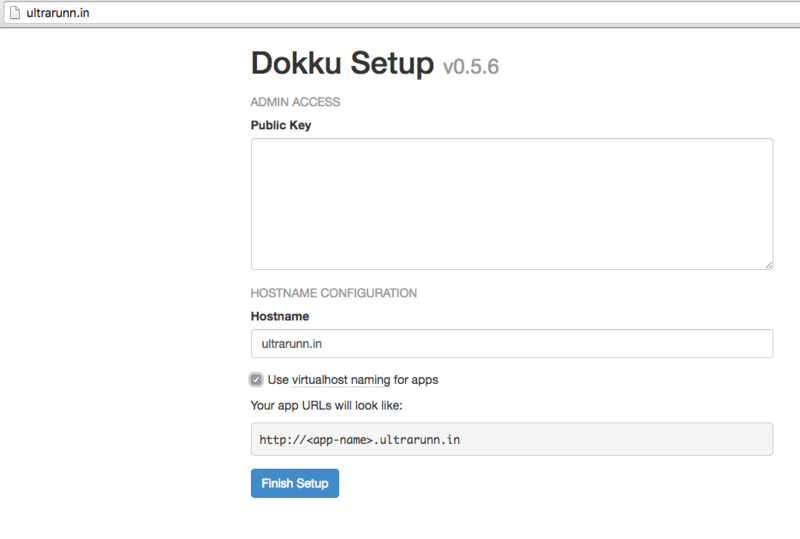 In reality though, it's a guide to deploying to anywhere you can host Dokku. I choose Digital Ocean because it's easy and convenient to set Dokku up. You will need a Digital Ocean account, once you have one head over to their management interface and login. You should see a list of your current droplets. Click on the "Create Droplet" button highlighted below. After you have clicked "Create Droplet" look for the "One Click Apps" tab. Then we are looking for the Dokku image. Next we select a size and region for our Droplet. We configure any additional options, I usually add an ssh key and then click "Create". I want to setup a domain name to point at the Dokku instance, so once the Droplet is created I make a note of the IP and head over to the "Networking" tab, below. I then add a domain name for the IP address I made a note of, the domain name below just happens to be one I have spare. With that out the way it should be possible to head to http://ultrarunn.in and see the Dokku setup. I want to use the domain name I setup and I configure the use of virtual host naming, then I click "Finish Setup". Right, let's get something to deploy. It's easy to get started with Cryogen, in a suitable directory run the following. Then cd my-blog and run lein ring server. You should then see the default Cryogen site in your default browser. Next, stop the ring server. While still in the my-blog directory run git init and git remote add deploy dokku@ultrarunn.in:ultrarunn.in. At this point I take a copy of everything in the my-blog directory and clear it down, apart from the git required files. I then move the contents of resources/public from the copy I made of my-blog into the root of the my-blog folder and commit everything to the master branch. I then add a .env file in the root with the following contents. This instructs Dokku to use the GitHub repo for it's build back. This build back is an nginx buildpack that supports static site generators, I didn't create it but forked it and made some small adjustments. This buildpack also requires a .static file to exist, so I run touch .static and commit the changes to master. Now it's as easy as running a git push deploy master. After a couple of minutes (It's longer the first time as it downloads the buildpack, which is then cached) browsing to http://ultrarunn.in/blog should result in. 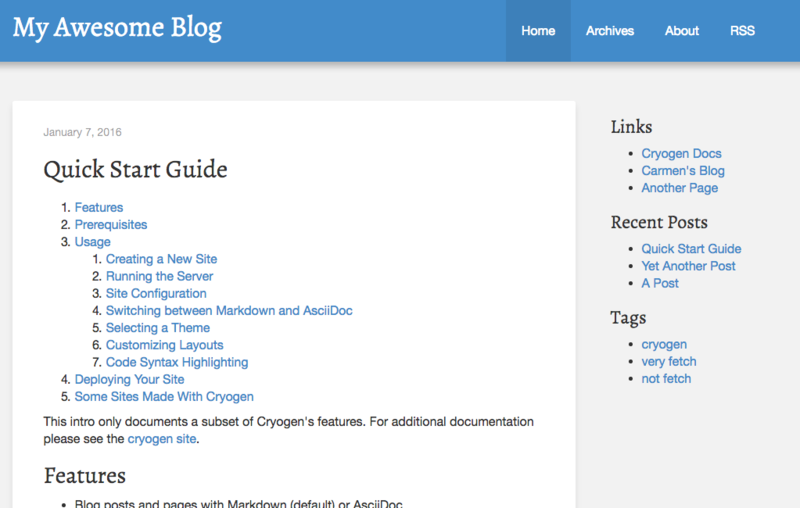 Note, the /blog comes from Cryogens config and can be easily changed, if desired. With all of that done I run git checkout -b source and copy the contents from the copy I made of my-blog, I then commit that to the source branch. This leaves us with master containing the results of lein ring server i.e. the static blog and source containing the source code. Anytime I push master to the deploy remote I update the deployed blog. I then push the git repo to GitHub/BitBucket etc. I ended up creating a less than perfect script to automate this somewhat. I checkout the source branch, run vim publish.sh and add the following. git commit . -m "Publish"
I then commit publish.sh, run lein ring server and then kill it. Running publish.sh while on the source branch will copy the static content from resources/public, stash it a level higher up in ../public, checkout the master branch, copy ../public/* back in and commit the change. After which it will push to deploy and master.